Do you know that you can now make your mobile phone number becomes your Postal Office Box number? The Postal Corporation of Kenya(PCK) is making this possible through its new revolutionary mobile based postal services dubbed 'mpost'. This is Mwabaya and am a registered mpost agent through AjiraDigital.Therefore I will take you through the process which will finally enable you to have a personal Box Number and that number am talking about is simply your phone number.No more sharing school or church box numbers! Your phone number is your box number. What's your mpost box number? Whether you're a safaricom,airtel or orange subscriber, your mpost box number will be like this: 07xxxxxxxx-YYYYY.Replace 07xxxxxxxx with your mobile phone number and YYYYY with your preferred collection post office code. After registration, you can now spread the most box number to your friends or general public to start sending you mails or parcels. Q1. I have registered and paid 3000 via Paybill transaction no KGC57W8NFP, my no is 0724986380-40400. Kindly help as I did not get any feedback indicating that my number is registered. Ans:The payment which was made is kshs 300 and not Kshs 3000.We have confirmed and sent a confirmation text to the customer. Customers with the same complaints/inquiries may email us on info@posta.co.ke or call 0719072600/0203242600 so that we may assist. Q2. In the traditional postal service, personal and company terms of operation were different cost-wise. Can I have one for a company with Ksh. 300? Ans:Yes, one may use the Mpost service for corporate purposes. One needs to indicate the certificate registration number in place of ID number when registering. Q3. Can I use this service to receive goods/parcels from abroad? Ans:Yes, one can receive goods from anywhere world wide. The address should be the customer’s telephone contact plus the code i.e 0712345678-00100. Q4. 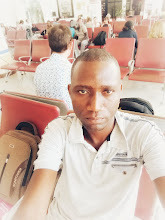 If need be and I am in Kisumu for 3days and would like to receive my urgent mail in Kisumu, would I have the option to select Kisumu for that particular instance? Then revert later to my 00100? Finally what happens in case I fail to pick my letter and have changed my location? Is it forwarded to the next post office? If so are there any charges? Ans:Yes, for location change one is required to send the word “CHANGE “to 40777.The mail will be delivered to your new address if the sender indicates your new location/address on the letter as oppose to the previous address. If a mail is addressed to the location it cannot be automatically redirected to another location. However the addressee may request for a redirection from the Head of that particular office where the mail was addressed to. In case of non-delivery it is returned to the sender after 1 month for local item and 2 months for an international item. Q5. Will it be possible to change from the current system to new? What are the requirements? Secondly will the corporate boxes have the same procedure? Ans:The physical letter box and Mpost service are two different services but one can link his /her physical letter box by sending the word” SUBSCRIBE” to 40777 and follow the steps or register for the new Mpost service by sending the word “MPOST” to 40777. The procedure for corporate box registration is the same only that one needs to indicate the certificate of registration number in place of ID number when registering. Q6. Now that most of the numbers will be rolled out to the public. For security reasons, which number do we expect to be getting messages from? Just to be sure it’s Posta. Q7. Will there be an extra charge to pick the sent letter or parcel at the post office. Ans:There are no extra charges for picking mails at the delivery office but if the customer requests for door delivery he/she will be charged kshs. 200 within the town where his delivery post office is located. Q8. What will you do to curb the long queue at Huduma Centers? Ans:The long queue is normally due to the security screening at the entrance but once one enters into the banking hall the process is shorter. Q9. When is the effective start date of the new service? What happens to my existing postal address? Ans:The service was officially launched and it has already started. One may use both the physical postal address and the Mpost service or any of the services. The two services can be used by linking your physical letter box to Mpost service. This can be done by sending the word” SUBSCRIBE “to 40777 or use one of them. Q10. I have an existing old Postal Address at code 40400, should I do away with it and adopt the new MPost? Will the old address boxes be phased away? Q11. How long will the letter or parcel stay at the post office if not picked? Ans:The retention period for a local mail is 1 month while for international items is 2 months after which it is returned to the sender. For relatively large parcel, the item attracts demurrage charges as follows; for the first 7 days while after the item has been received at the addressee’s postal office, the retention is free. After the seven days, the fee is kes 40/= per day and kes 60/= after the 14 days. Q12. Once the payment is done via Paybill is the registration process completed automatically? Ans:Once one completes the registration he/she will receive a confirmation/congratulatory text for a successful registration within 5 minutes. However in case of a delay the customer may contact us for assistance. Q13. Is there delivery service for those who cannot pick up mail? M-posta delivery? Ans:Yes, the delivery fee is kshs 200 within the town where the customer’s delivery post office is located. Q14. Hello. I have not renewed my box for this year as I got admitted in the hospital and never bothered to check or renew after being discharged. Is it still my box and how do I get rid of it in favor of this digital? Ans: furnish us with both the Name and the box number (inclusive of the postal code) so that we may follow up and assist you on the status of the box. Note that you can use either both Mpost and physical address or any of the services. Q15. Have you partnered with eBay and Amazon or any other online vendors on this new venture Ans: We currently do not have any partnership agreement with eBay and Amazon but we do deliver items bought from local and international online vendors. Q16. Is it possible to have the letters received forwarded to another postal address out of the country? E.g. I am in Uganda right now, can I have letters received on my address forwarded to my Ugandan postal address (even if it’s at an extra cost)? Ans: Mpost is currently a local product used to deliver local mail. We therefore advise customers to use the Ugandan postal address for smooth delivery. Q17. 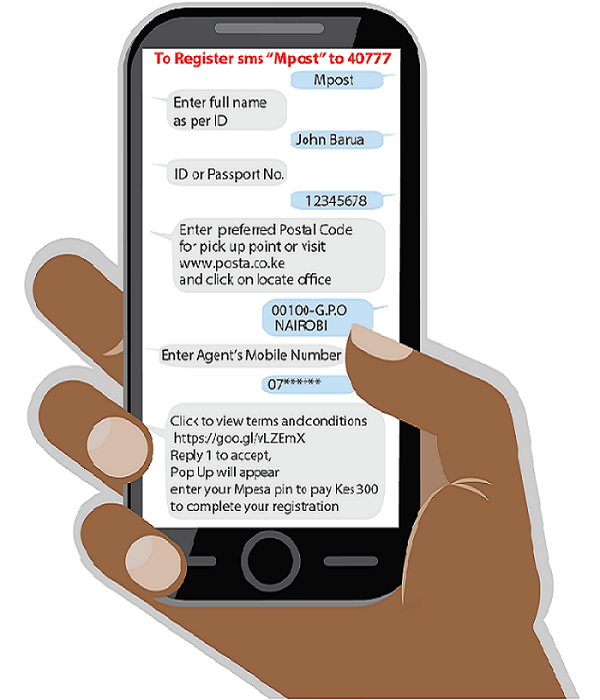 Can a customer use his postal box number instead of the mobile number when registering for MPOST? Ans: Yes. However, this only applies if he/she has an existing physical box. In order to link the the Mpost service to the physical box sms the word “SUBSCRIBE” to 40777 and follow the simple steps. Ensure that the registration fee of 300/= is made using the box renters mobile no (i.e. The mobile no of the box owner). Q18. What happens when a customer forgets to include the post office code during registration and the registration process is complete? Ans:The Customer service team will get in touch with the customer to obtain the Post Office Code. Q19. Why is there delay in receiving notification after subscription? Ans: Kindly note that the issues of delay have been resolved. However, if there is a delay kindly contact the call center on 020 3246000 / 0719072600/ info@posta.co.ke. Q20. What happens when one registers and does not get a notification? Ans: In case of any delays kindly contact the call center on 020 3246000 / 0719072600/ info@posta.co.ke. Q21. How efficient is the notification service? Ans:The notification service is very efficient, however in case of any delays kindly contact the call center on 020 3246000 / 0719072600/ info@posta.co.ke. Q23. How can one link the physical postal box to Mpost? Ans: In order to link the the Mpost service to the physical box sms the word “SUBSCRIBE” to 40777 and follow the simple steps. Kindly ensure that the registration fee of 300/= is made using the box renters mobile no (i.e. The mobile no of the box owner). Q24. Is the notification service available for all services i.e. EMS, Registered, ordinary, (letters and parcels)? Ans: For Mpost registered customers notifications will be sent for letters and parcels. EMS is more of a door to door delivery service in which the customer is called to collect the posted item(s) from the post office in case of non-delivery. Q26. Will customers who currently own physical letter boxes get their yearly fee reduced since Mpost is offering the same services for Kshs. 300 per year? Ans:Mpost is a product with value-add services thus different from the annual rental fee. Q27. What is the logic of owning a physical box if one can use a telephone number as a box number? Ans: Having a physical box also has its advantages such as convenience. A customer can easily access their mail even after the office working hours as well as on weekends and public holidays.Mpost is a service which has also enabled customers especially those in high demand areas that do not have physical boxes to own a box. All in all customer preference is most paramount for us; therefore a customer is not tied to one service. They can actually have both. Q28. Will the customer be charged for change of delivery location (office)? Ans:Currently there are no charges for change of delivery location. The only charges applicable are for the sms alerts. Q29. What is the process of changing from one telephone address to another? Will the change attract additional cost? Ans: Yes, changing from one telephone no. to another will cost Kshs 300 since the new number has to go through the registration process/be registered by sending the word MPOST to 40777 and following the simple steps. Q30. Can the telephone address be shared with other people like the fixed private letter box Ans: Mpost is specific to the user who has been registered since collecting or delivery of mail will require authentication and this is done by using the ID no. or Passport number of the recipient. Q31. Will the fixed private letter box subscribers receive alerts to collect their letters? Ans: Yes, customers will receive alerts on their letter only if they have registered/subscribed to the Mpost service. This can be done by sending an sms with the word “SUBSCRIBE” to 40777 and follow the simple steps. Ensure that the registration fee of 300/= is made using the box renters mobile no (i.e. The mobile no of the box owner). Q33. Can one register using some else number e.g spouse cellphone number. Ans: No. Someone can not register using someone else number. One can pay for another person as long as they put the correct account number i.e (mobile number-postal address) for the other person when making payment. Q34. Can one register using other service providers e.g Airtel or orange Ans: Yes. So far one can only register using Safaricom and Airtel. Q35. Can one give up their rental box for Mpost box. Ans: Yes. But it would be more advisable for one to retain their box and subscribe to Mpost for notifications especially if you get very many letter/mails. Every notification costs 20 shillings, if they receive a lot of mail it will be more expensive for them but if they subscribe for notifications they can only receive 2 notification messages in a day.